At SAI, we don’t offer solutions in a catalog, we provide our customers with complete customization of their Electrical Distribution Systems. From start to finish, SAI customers are involved in every step of the process, ensuring they get the system they want – rather than the system other manufacturers are only capable of building. SAI custom designs and manufactures Low Voltage Switchboards. SAI custom designs and manufactures Low Voltage Switchgear. SAI custom designs and manufactures MBP and Paralleling Boards for UPS applications. SAI custom designs and manufactures Paralleling Switchgear that can be used for Standby, Prime Power and Distributed Generation Systems and Main-Tie-Main (Utility to Utility). 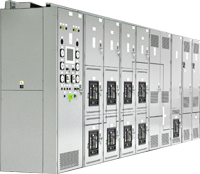 SAI integrates Medium Voltage ANSI Metal Clad Switchgear. 25kA to 63kA short circuit withstand. 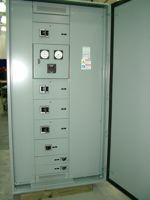 SAI custom designs and manufactures ANSI Metal Clad Switchgear. Can be manufactured from NEMA 1 to NEMA 3R, with ratings of 1200A to 3000A, from 5kV to 38kV and 25kA to 63kA short circuit withstand. SAI custom designs Power Control Systems that extract mission critical information. Our control systems maintain full functional control of generator-sets, breakers and other third-party equipment while allowing you to modify to the parameters under which it functions. SAI custom designs and manufactures a wide range of DC Switchboards. SAI custom designs and manufactures a wide range of DC Disconnect Cabinets that allow you to isolate your battery strings from your UPS for added safety and ease of maintenance. SAI’s generator cable junction boxes are designed to allow quick connections for a temporary or portable generator. These junction boxes can be built to any Nema standard. SAI custom designs and manufactures UL 67 Listed Panels for a number of applications. SAI custom designs additional Breaker/Cell Provisions into your existing switchgear line-up. Whether your equipment is old, faulty or you simply need to expand, SAI can provide breakers from all major manufacturers and integrate OEM cell provisions, or build our own detail in order to get you back up and running fast. Critical Components is the Southeast’s source for SAI Customer Electrical Distribution : low voltage switchboards, switchgear and more. Serving the Southeast including Georgia, Alabama, Florida, Atlanta, Birmingham, Orlando, Tampa and Jacksonville. 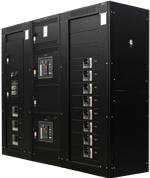 Critical Power, UPS, Network Power, data center power and backup power solutions.